The school was awash with ‘blue’ today, for a special Mufti day to raise awareness for the ‘Connor Saunders Foundation’, as part of ‘Anti-Bullying Week’. Connor tragically lost his life, at the age of 19, when a single punch to the head, after an altercation with some other boys, killed him. We were very privileged to welcome Connor’s mother, Darran Saunders, into school yesterday, to share Connor’s story, raise awareness of the foundation and support the pupils of King Offa to be ‘heart-safe’, through some superb workshops. Connor was a registered organ donor and, following his death, five of his organs were used to save the live of others. Connor, a keen footballer, who was concerned about the heart safety of footballers, wanted to see defibrillators at all clubs – the Foundation now campaigns for better awareness of heart safety among lots of young people and we were delighted to receive the school’s own defibrillator, which will be situated in school. Thank you to all of you who have supported this. We have raised £367.40! Your donations today will go a long way in supporting the ‘Connor Saunders Foundation’. In today’s assembly, Kings and Queens were all chosen for the same reason this week – ‘for demonstrating kindness’. The children were nominated by their class mates, with a democratic vote. 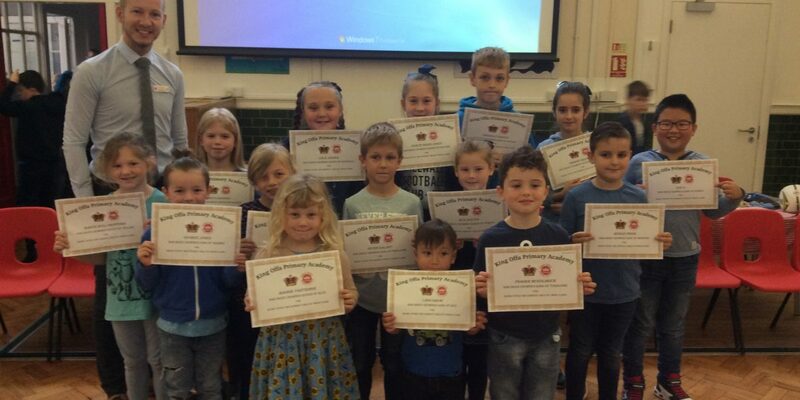 Well done to the children who show kindness and friendliness all year round. Also, as part of ‘Anti-Bullying Week’, we have been running a poster competition in school. This year’s theme is ‘Choose Respect’ and pupils had to design a poster that reflected this theme. Mrs Meader and Miss Baker chose this year’s winners: Congratulations to Emma in Year 6, Megan in Year 3 and Georgina in Year 1, who were winners of the competition. Thank you to all of you have joined us for Parents’ Evening this week. It was lovely to see so many of you. If you weren’t able to meet your child’s class teacher this week do make an appointment to do so. I hope you all have an enjoyable weekend.